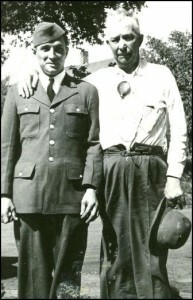 My grandfather on my father’s side was Earnest Hulbert Larsen 1st. I call him the 1st because his oldest son was the 2nd, and his son was the 3rd. I don’t know his date of birth and I don’t know his date of death as I write now, but I’m sure i’ve seen it before and when I find it, I’ll post it. He Married Maude Elliott and had four children. Clare was the oldest, followed by Earnest H. 2nd, and then Dad, and finally Rosemary. 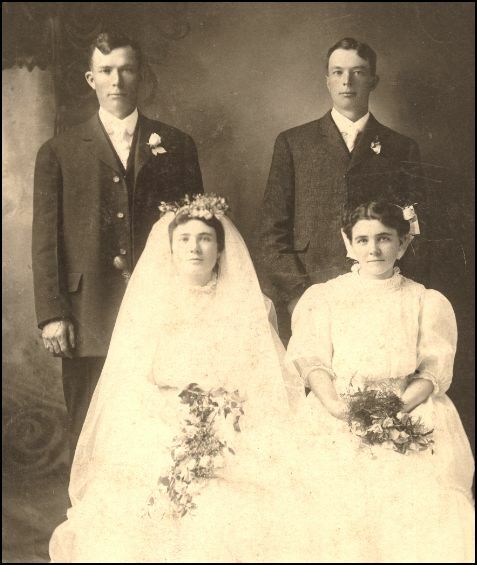 This is his weddig picture to the left and the couple on the left are EH1 and Maude. I don’t know who the other couple is. I have very few pictures of EH1 and most of them that I have are really in bad shape. I’ve scanned them all and tried to enhance them as much as I could, but nothing reallyhelps. I know EH (As most of his friends called him) was a real rough and tumble guy. He was a plasterer by profession and self trained in everything in life. 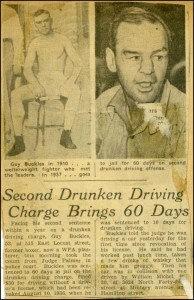 He was a real “fight” promoter in every sense of the word. 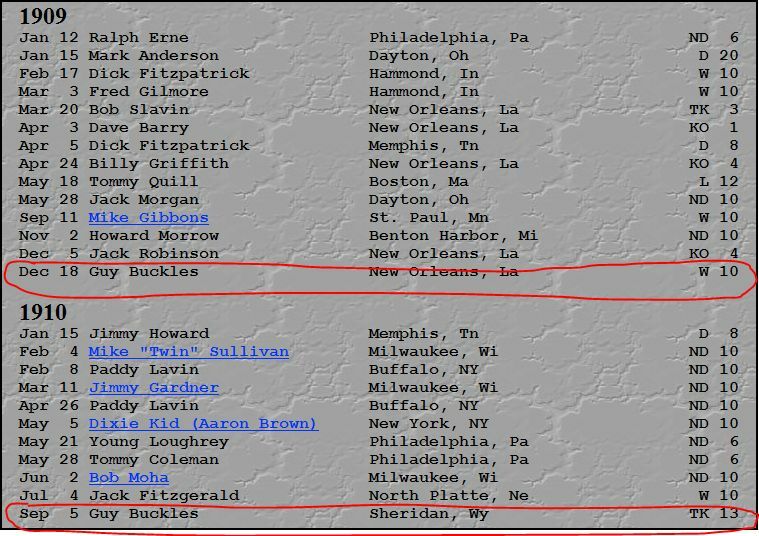 He managed professional prize fighters and had one, Guy Buckles, that made up to the top 10 contenders for the Welterweight crown. I think it was back in the very early 1900’s. When he got good, he left EH and got himself a real promoter . He ended up getting beat up by the better boxers and coming back to Omaha. But he fought some of the best boxers in the world at the time. He fought Jimmy Clabby twice. Once in 1909 and once in 1910. 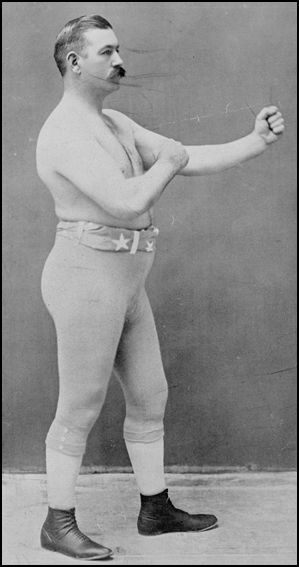 Clabby was the Welterweight Champion of the World at the time. He went the full 10 rounds for the first fight but lost by a decision. However, he was knocked out in the 13th round in the second fight. 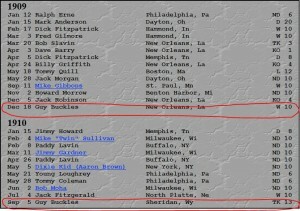 Buckles’ name shows up most oftine in boxing history and ring record books for being one of those who fought the better fighters but was never quite able to get it together when he needed it most. I believe he struggled, like many men did in those days with alcoholism. It’s intere sting that he and EH remained friends through it all from what I understand, but what do I know. 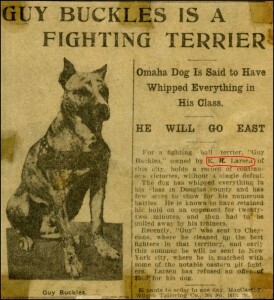 I think so because old EH named a fighting pit bull dog after him. The pit bull dog did a lot better all over the country than the human Guy Buckles. The dog travelled all over and won every fight it ever had. I’ve often wondered if it was figh to the death like many pit fights but I don’t know for sure. The interesting thing is that it was legal back then. No, it was actually applauded back then. 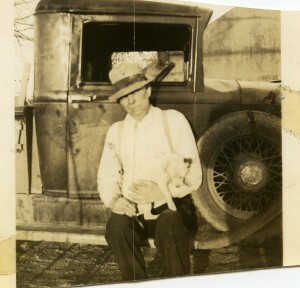 Old EH fought humans, he fought roosters and he fought dogs. He was really into it, and as far as I know he never had any legal difficulties over it. It was just an accepted sport in those days. The Omaha Paper. I think it was the Omaha Bee at the time, but I’m not sure of that either, ran a big article on Guy Buckles the dog as if it was something Omaha should be proud of. He was a plasterer and a stucco man just like his two sons. That might have had something to do with the fact that they didn’t value education or just couldn’t afford it. Regardless, they ended up doing stucco and plastering. I think EH1 and EH2 went into business together for a while because of this business card. It might have been my dad who was the son, but I doubt it. 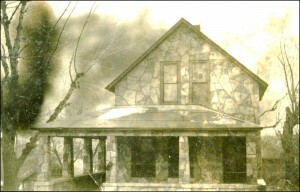 The old home where all four of the kids grew is the address o n the card. It’s 4735 Seward St., Omaha, NE. Their next door neighbors were the Donovans. The Donovan Mom was Maude’s Sister, so the kids grew up next door to their cousins. I’ll talk more about them when I do my Dad’s Mom’s page. 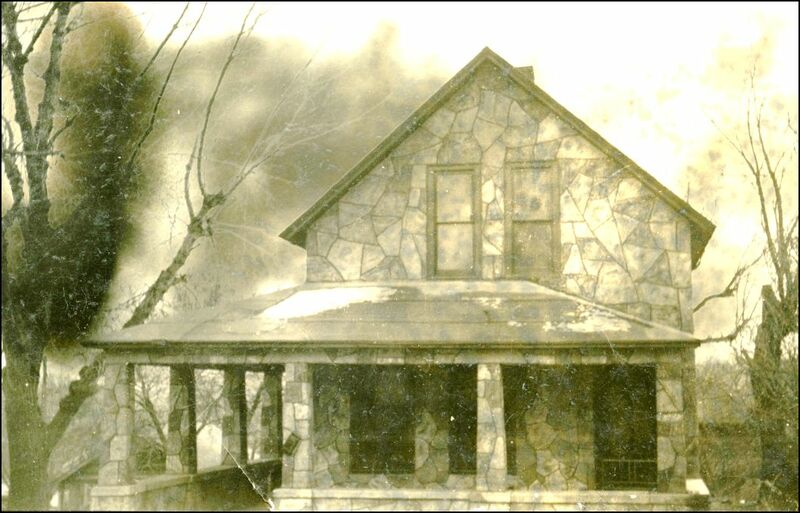 The Seward house is long gone, I think the Military Highway or Saddle Creek took it out, but I’m not sure. It’s been gone a long time. I was there a couple times in the 50’s when Clare and her husband Tom Wilson lived there for a while. But I don’t remember it. One thing everyone seems to remember about the Ole EH also is that he was going deaf and he had a huge bell hooked up to the phone and you could hear it ring around the block, or so the story goes. He wore a device around his neck (see it in this picture with his son charles 1) it helped him with his hearing. He would also wear a rope for a belt ofte from what Iheard. He is here. As I mentioned already, I don’t know when EH died, but I’m still researching this information. I’m thinking it was around 1939 or 1940 because it was when Dad was in the Army for the first time. 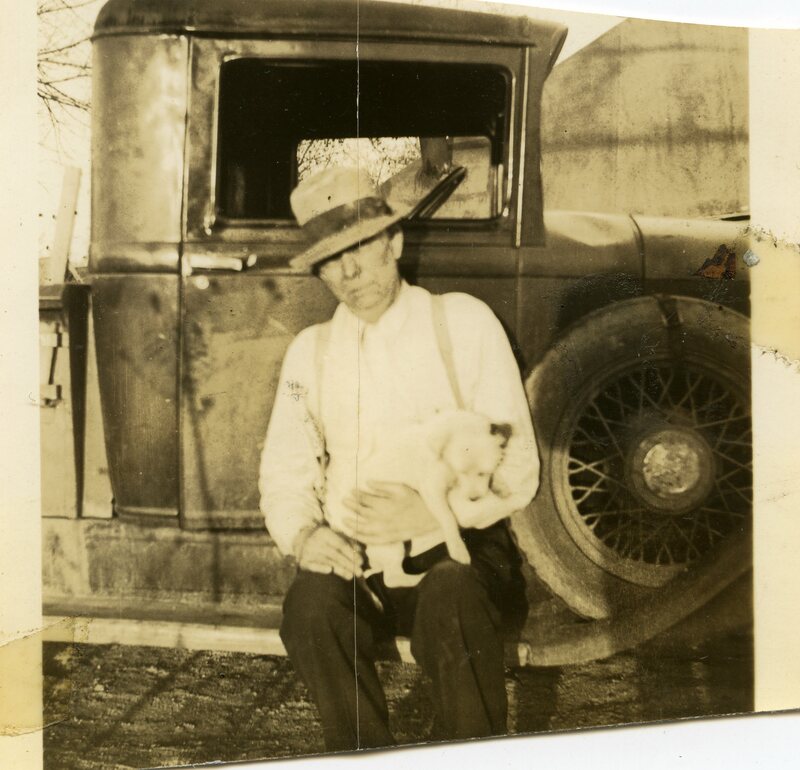 After Eh’s death, he got out on a hardship to come back and help provide for Rosemary. Or so I seem to remember.